On May 2 at its special education-focused event, Microsoft revealed Windows 10 S to the world. This edition of Windows 10 allows schools, businesses and home users to use a version of the popular operating system that's restricted to installing apps from the Windows Store. This allows for tighter management of what is run on Windows 10 S devices, so they're unlikely to be infected by viruses included in dodgy downloads. Limiting what apps can run on the device can also allow low-cost – and low-power – devices to run Windows 10 S, where they might struggle with standard Windows 10 installs. The potential for Windows 10 S is huge, but we still had a few questions about how Windows 10 S will work, the compromises we’ll need to make if we want to use it, and what Microsoft’s end goal is in creating Windows 10 S.
So we chatted to Robert Epstein, UK Product Marketing Director for Windows, about Windows 10 S, and what it means for the future direction of Microsoft. One of the biggest questions many people had when Windows 10 S was revealed was whether it was a brand new and separate version of Windows. Epstein was quick to point out that this is not a new version of the OS. That means that choosing a machine with Windows 10 S installed won't mean you’ll be missing out on many – if any – features of Windows 10. “Windows 10 S can do everything Windows 10 does, because it is Windows 10, you can have it on hardware that uses Pen and touch,” Epstein added. While we’re not too surprised to learn that Windows 10 S will support stylus and touchscreen inputs, what Epstein then revealed did surprise – and excite – us. “Later on – on the right hardware – Windows 10 S will be compatible with our mixed reality devices,” he said. That’s right – in the future devices running Windows 10 S should be able to use mixed reality headsets such as Microsoft’s own HoloLens, its mixed reality controllers, and third-party headsets like the ones created by Acer. Of course, this will depend on the hardware of the Windows 10 S device itself, but the move makes sense considering that Microsoft is pushing Windows 10 S as an operating system for teachers and students, while also extolling the virtues of mixed reality as an educational tool. What this means is that you can get a Windows 10 S device and not worry that you’re going to miss out on any new features and devices that Microsoft brings to Windows 10. That includes future major Windows 10 updates, such as the upcoming Fall Creators Update. “In that respect everything is just the same as Windows 10,” Epstein said, when we asked about future Windows 10 updates coming to Windows 10 S.
What can Windows 10 S do for us? So if Windows 10 S is so similar to Windows 10, what does it offer to users? There are two major advantages that Microsoft wants to highlight: security and guaranteed performance. “The idea behind this is to ensure that we have a more managed environment for Windows,” Epstein explained, “and therefore users can be confident in the security of the software they’re installing”. So, rather than downloading a program from a website that could be hosting malicious software, you can confidently download the app from the Windows Store, knowing it has been checked by Microsoft. As with apps installed on smartphones and tablets running Android or iOS, apps from the Windows Store are kept separate from the operating system, which means they won’t be able to change system-level settings that could cause security problems. Having tightly managed apps that don’t change system settings isn’t just about keeping your machine secure – it can also keep it running fast. It means programs don’t load themselves into your PCs memory when they’re not being used. Many programs do this (just open up the Task Manager with Ctrl+Shift+Del to see), and while it makes the programs load faster when you do decide to use them, it can also slow down your PC. “There’s plenty of software out there that is installed in a traditional way, where it will set itself up to load into memory during the initial boot sequence – even though the software may not be used during that session,” said Epstein. “That might make the software look great, because when a user does decide to run it, it can pop up really quickly, but of course actually it just slows the boot experience down for users every time. Uninstalling programs only to find they’ve left bits and pieces on our PCs is incredibly frustrating, and the prospect of apps not being able to do this does make Microsoft’s Windows Store-only vision for Windows 10 S appealing. With a regular OS, the more programs you install – and uninstall – the slower your PC will become over time, and it looks like Microsoft’s aim with Windows 10 S is to overcome this. In the run-up to the reveal of Windows 10 S there was speculation that Microsoft was preparing to launch a stripped-back, lightweight version of Windows that would run fast on even the weakest hardware. However, given Microsoft’s revelation that Windows 10 S is using pretty much the same code as Windows 10 Pro, that’s obviously not the case. “If you took two identical machines, fresh out the box, one with Windows 10 S, one with Windows 10 Pro, and switched them on and did a performance benchmark then and there, you’re not really going to see any difference, because it’s the same Windows,” Epstein told us. However, rather than focusing on faster performance, Microsoft is targeting consistent performance over the years with Windows 10 S. That means that no matter how old your Windows 10 S install is, it should still run quickly. “The challenge is what happens when people use their machines over a long period of time. They get links to software they are not entirely sure of, or they have gone and installed some niche piece of software that wasn’t particularly well written. They might have tried to uninstall that, and it doesn’t do that very well. Over the years of use, then they may see degradation in performance”. So how can Microsoft guarantee better long-term performance than Windows 10? Through the reliance on Windows Store apps. While we can see the benefits of downloading apps from the Windows Store – especially for Microsoft – there is a bit of an issue. The Windows Store isn’t great. Sure, it’s made progress since its inception with Windows 8, but it’s still woefully understocked compared to the Android and Apple app stores. With Windows 10 S demanding its users rely solely on the Windows Store, the pressure is on to make sure the Windows Store is in a position to offer them what they want – and need. While Desktop Bridge focuses on developers, Microsoft has also launched the Template Studio, which is aimed at less technical users, but still with an eye to encourage more people to design UWP (Universal Windows Platform) apps that will appear in the Windows Store. “We also hope many developers will add additional features that the Universal Windows Platform provides, to allow them to really get the best out of the Windows environment,” said Epstein. “So it can make it easy for them to design an interface that works on a number of screens and form factors, be it phone, tablet, Xbox, and more. Could the fruits of Microsoft’s labors finally be starting to appear? Recently a few major pieces of software have launched as apps on the Windows Store. Who is Windows 10 S for? Still, no matter how wide the range of apps available on the Windows Store becomes, Windows 10 S users won’t have access to the sheer breadth and freedom that those running standard Windows machines enjoy. The security and performance implications of only using the Windows Store make sense, but is that really enough to encourage people to drop that freedom in favor of Microsoft’s walled garden? When we put that question to Robert Epstein, he was keen to point out that mobile operating systems had set a precedent in this respect. Epstein’s reference to “the right customers“ is important to note. Microsoft is keenly aware that the mobile OS-like approach of Windows 10 S won’t be for everyone. So in a way Windows 10 S is an ‘easy mode’ for Windows 10 for less technical people. Windows 10 S made its debut at Microsoft’s education-focused event, titled #MicrosoftEDU, and it’s clear from what Microsoft said at the event, and what Robert Epstein is telling us, that Microsoft envisions a future where Windows 10 S is used in schools and educational institutions around the world. However, this comes at a time when schools in many countries are under intense pressure, with staff shortages, budget cuts and crowded classrooms; kitting out students with new Windows 10 S-toting laptops is going to be pretty far down their to-do lists, if it’s even possible at all. So, rather than seeing classes full of brand new Windows 10 S devices, we’re more likely to see older machines running Windows 10 S, hopefully prolonging the life of ageing hardware – something that lightweight Linux distros have excelled at. “Where schools have purchased PCs some time ago, particularly when a lot of schools went out and bought a lot of low-cost netbooks, then two years on, three years on, from the original purchase they are now maybe struggling with performance,” explains Epstein. Some of these older machines will be running on ARM hardware, rather than more traditional Intel or AMD processors, and will be using Windows RT, which was specially built for that hardware. Will those machines be able to upgrade to Windows 10 S? 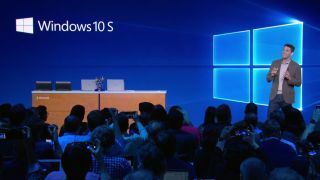 Another question was raised at the launch event when Microsoft declared that at any time a Windows 10 S user could switch from Windows 10 S to Windows 10 Pro quickly and easily – though for a small fee ($49 in the US – prices for other territories haven't been confirmed). What we wanted to know was would it be just as easy (or even possible) to switch from Windows 10 Pro to Windows 10 S? Something else we wanted to know after watching the initial reveal of Windows 10 S was will it be as easy to switch back to Windows 10 S from Windows 10 Pro? That’s a shame, but surely upgrading a Windows 10 S machine to Windows 10 Pro isn’t completely irreversible? What about using the System Restore tool to reset the device to its factory settings? What kind of Windows 10 S devices can we expect? After the reveal of Windows 10 S, details began to emerge about upcoming Windows 10 S devices. Of course, there was Microsoft’s own flagship Surface Laptop device, but a number of manufacturers such as HP, Asus and Acer have announced they're also creating Windows 10 S devices, with prices starting at $189 (around £145, AU$250). So does Microsoft have a vision of what sort of Windows 10 S devices we may see in the future? Is there a set of requirements the company sends to manufacturers when building a Windows 10 S machine? “‘No, the hardware requirements are exactly the same as Windows 10,” explained Epstein. “So we do expect to see a wide variety of Windows 10 S machines. Obviously at launch we’ve announced the Surface Laptop, that’s a high-end configuration machine. Will Windows 10 S kill Windows 10 Mobile? At the recent Microsoft Build event, where the company talked about its plans for the future, there was a noticeable lack of announcements regarding Windows 10 Mobile, Microsoft’s struggling smartphone operating system. Given this fact, along with the focus on Windows 10 S, many people assumed that Microsoft was readying Windows 10 S as a possible replacement. However, Epstein was keen to stress that this isn't the case. “We’re still committed to the Windows 10 Mobile platform – there are some devices out there today from HP, Acer and a couple of other partners.“ Pointing out that there are “some devices out there“ isn’t hugely encouraging for anyone hoping that Windows 10 Mobile is due for a resurgence, but it does mean that Windows 10 Mobile and Windows 10 S will coexist. Recognising that a large number of people use Android and iOS, and are unlikely to switch to Windows 10 Mobile, is a wise move, as is Microsoft making its apps and services available to that vast audience.